It’s a new beginning, a new era of sorts. Southern Modified racing will change this Saturday and it will never be the same again. The inaugural NASCAR Southern Modified Tour race will be held Saturday night at Caraway Speedway in North Carolina and all eyes from that important office in Daytona Beach, FL will be on that race. For years, Modified racing in the south has been run by an independent group known as SMART (Southern Modified Auto Racing Teams), but they have stepped aside for now to allow NASCAR to attempt to bring a new level of excitement and prominence to the division. And they have without the new series even turning a lap. 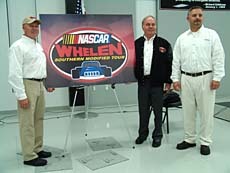 That was evident on Wednesday evening when the announcement was made at the Richard Childress Racing shop in Welcome, NC that Whelen Engineering would be the series sponsor. 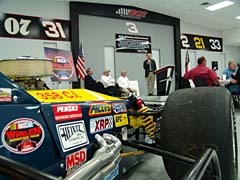 The Whelen announcement was very important in the grand scheme of bringing the Southern Modified to prominence once again, but maybe more important to the short term, was NASCAR’s announcement this week that they will increase the point fund for the Southern Modified Tour significantly over what it has been in the past. “We are pretty comfortable that we are going to at least double it,” said Hawk. “We also have Anheuser-Busch that stepped in and is going to offer a pole award; Powerade came along with a hard-charger award, Featherlite with a “long-haul” award and CV Products as well. We have more stuff coming down the line too. What is also going to help is exposure and it all begins on Saturday night. Speed51.com will be there to cover the action every step of the way and its editor Bob Dillner, who is also a Television commentator for SPEED Channel, will bring one of the networks cameras there to provide hi-lites and interviews to its SPEED News program on Sunday at 7pm EST. The event at Caraway this Saturday is big for many reasons, but none more important that the fact that these Modifieds will put on a heckuva show. Geoff Bodine (left), Jerry Cook (middle) and Scott French (right) pose with the new SMT logo.